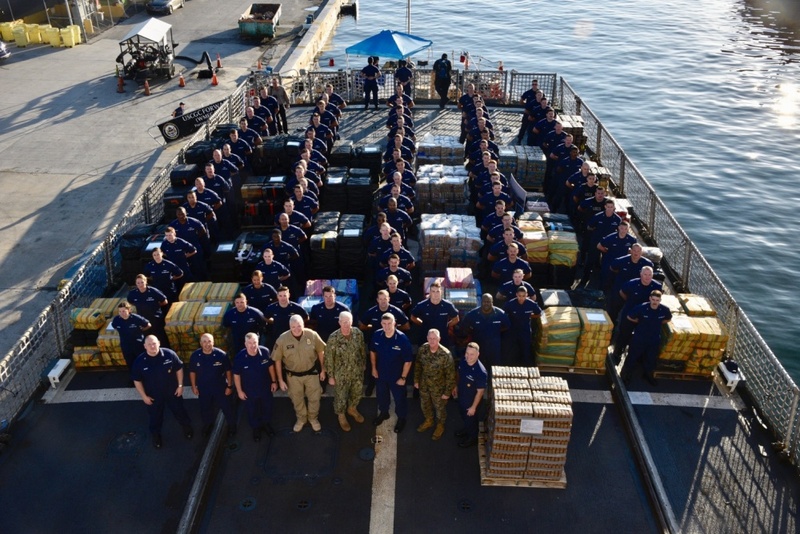 The crew of the Coast Guard Cutter Forward offloaded approximately 34,780 pounds of cocaine Tuesday in Port Everglades worth an estimated $466 million wholesale seized in international waters in the Eastern Pacific Ocean. The Coast Guard Cutter Hamilton was responsible for five cases, seizing an estimated 9,460 pounds of cocaine. The Coast Guard Cutter Campbell was responsible for four cases, seizing an estimated 6,153 pounds of cocaine. The Coast Guard Cutter Alert was responsible for two cases, seizing an estimated 5,736 pounds of cocaine. The Coast Guard Cutter Venturous was responsible for one case, seizing an estimated 1,565 pounds of cocaine. The Coast Guard Cutter Confidence was responsible for one case seizing an estimated 553 pounds of cocaine.